In any team sport, one of the more difficult aspects is determining the influence of individual players within that team. In football, drawing out which players are really driving the team and which players appear good purely as part of being part of a successful system can be very difficult due to the fluid and interconnected nature of the sport. However, in T20 cricket, it is easier, particularly if we view a match as a series of individual contests between batsman and bowler. Now, while this system only takes into account international matches, it does not seem too bad. Given his form recently, there are not too many people that would argue with Virat Kohli topping the rankings, while we see Joe Root, Alex Hales and Chris Gayle in the top 10, all of whom appeared in the T20 World Cup Final earlier this year. 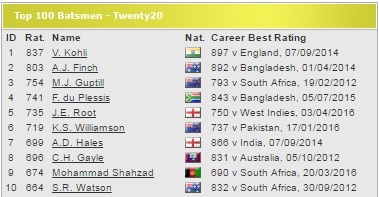 However, it also feels as though there are a number of big T20 players that are missing from the top 10. Again, we see Virat Kohli topping the ratings here, but there are a number of new names that appear here. Ab de Villiers and David Warner are the two standouts here that were missing from the ICC version and if you asked cricket fans, I would suspect that they would include those two names in their top 10. There are also a couple of more unexpected names appearing here, particularly Yusuf Pathan and Reeza Hendricks. Now, over the past six months, I have been building up a database of ball-by-ball T20 data, which has enabled me to come up with my own rating system. Similarly to the Cricket Ratings system, my rating system is built around two aspects - average and strike rate. Clearly, any top T20 batsman should be strong in both of these areas - it is no good having a high average if you only score at a strike rate of 100.0, but similarly, there is no point in having a strike rate of 150.0 if you generally only last a couple of balls. In my model, the strike-rate aspect is based around the concept of comparing the runs that a batsman actually scored against the runs that a batsman would be expected to score. This run expectation is derived based on a number of factors, including the ground, the time of the innings and the quality of the bowler. For example, if a batsman is playing at the M. Chinnaswamy Stadium in Bengaluru, facing a ball in the final over of the innings bowled by Ishant Sharma, they would be expected to score more runs off that delivery than if the same batsman was facing the first ball of the seventh over at Sabina Park against Sunil Narine. By comparing the runs that a batsman scored off each delivery compared to the expected runs, we can see which batsmen score at a higher than expected rate. 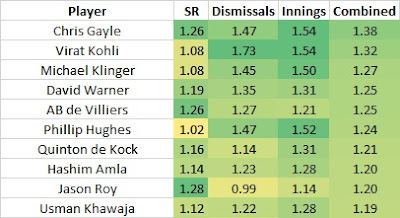 The average aspect is based around looking at the runs scored per innings and the runs scored per dismissal, again adjusted by the ground and the quality of bowling. For example, if a batsman had averaged 30.0 runs per dismissal, but most of the bowling that he had faced was against low-quality county bowling, he would be marked down compared to a player with the same average, but who had faced the likes of Sunil Narine and Mitchell Starc on a regular basis. 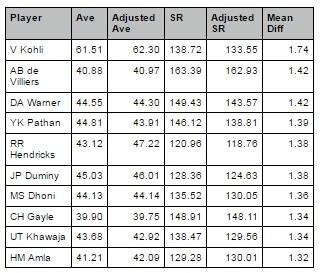 Chris Gayle actually tops my rankings, although Virat Kohli maintain a top 2 place. It is the incredible strike-rate of Chris Gayle that draws him above the Indian in this ranking. Michael Klinger is a name that appears in third place in my ratings that was conspicuously absent in both the prior rating systems. I would surmise that his absence in the previous systems were due to Australia's bizarre reluctance to pick him at international level (ICC Rating) and the fact that the majority of his appearances have come in the T20 Blast and Big Bash, where the quality is deemed lower than the IPL (Cricket Ratings). 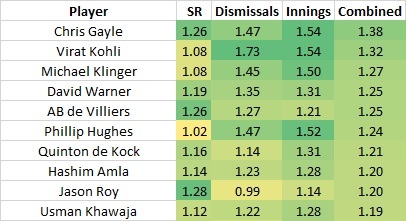 David Warner and AB de Villiers round out the top 5 in my ratings. As my data is based around a weighted average of performances over the past five years, the name of Phillip Hughes appears at number six. As all cricket fans will remember, Hughes tragically passed away in November 2014 having been struck by a bouncer, so unfortunately we shall never find out whether he would have gone on to become one of the T20 great batsmen. We find the South African pairing of Quinton de Kock and Hashim Amla, England's Jason Roy and Australia's Usman Khawaja also appear in the top 10. Jason Roy is an interesting one as we can see that while his longevity in terms of his innings are nothing all that special, but he does have a remarkable strike-rate part of the rating, showing his ability to score at an impressive rate. We find the likes of Dinesh Chandimal, the former Sri Lanka T20 captain, who actually dropped himself during their successful 2014 World Cup T20 triumph, and Manoj Tiwary, who has been a regular in the IPL and has represented India at international T20 level. 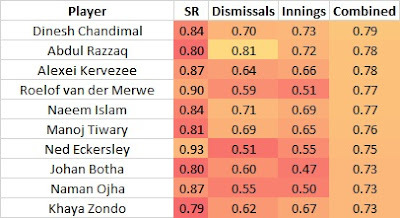 However, no player is ranked as badly as South African, Khaya Zondo, whose combination of dreadfully slow scoring and poor average means that he is officially the worst T20 batsman in the world based on my rating system. From an England perspective, while Jason Roy was the only batsman in the top 10, there are a number of other Englishmen in the top 25 with Sam Northeast (#12), Luke Wright (#14), Joe Root (#21) and Michael Carberry (#23) also suggesting that England does have plenty of T20 batting talent at their disposal, although interestingly, Roy and Root are the only two that actual form part of England's T20 team. While the time has probably passed for Luke Wright and Michael Carberry, it will be interesting to see whether Sam Northeast gets an opportunity in the coming years to cement a place in England's middle-order. Finally, let us see how some of the names that appeared in the other ratings perform in my system. In the ICC ratings, we saw the likes of Aaron Finch, Martin Guptill and Faf du Plessis in the top 5, although they drop to rankings of 11th, 42nd and 66th in my ratings. In the Cricket Rating system, it is interesting that while there is agreement on a number of names, there are strong differences on some of the others. In particular, we saw the Indian pairing of Yusuf Pathan and MS Dhoni inside the top 10, but they drop to 223rd and 155th in my ratings, which raises the question of how the IPL is weighted in the two different systems.